We live in the region with heavy snowfalls. But the highest temperature in midsummer rise over 33 degrees Celsius sometimes. So important thing is how to enjoy the cool breeze for an Akita dog. If your Aita dog lives in your house as indoor dog, the dog can spend comfortable by the air conditioning. But if the dog lives in the outside kennel, the dog is be exposed to high temperatures. It is fine that the owner puts out the dog and applies water with a hose. But there are the ownners who can applies water with a hose sometimes and there are the owners who can do it not at all by being absent from home. The Akita dog to some extent growth has the fortitude against summer heat. But especially puppy needs the countermeasure against summer heat. So we'd like to intruduce you a way that puppy can spend comfortable in the hot summer. It is the very simple way what you give the pet bottle of 2 litters after frozen water in the bottle. It may not be less who practice the way. It just like ice pillow. Akita dog be pleased with it. Even if the temperature is 35 degrees Celsius before and after, the coldness keeps about 2 hours. If no one can take care tha Akita dog, the Akita's comfort is secured somewhat by keeping frozen a pet bottle before owner go out from houa. And if some one take care the Akita dog in the daytime, the person can continue to keep the frozen pet bottle by changing. 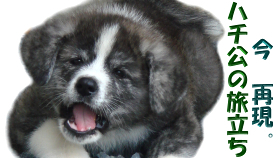 Not only puppy also grown Akita dog will be glad by doing it. So we think it's worth a try. But few Akitas mush the pet bottle to crush with their teeth. If you live with such the Akita, you have to prepare the pet bottles certain number. If there are plural puppies, there is a possibility what the best physique or the strogest puppy monopolizes the frozen pet bottle. Observe the appearance for pupies. If one of them monopolizes the frozen pet bottle, devise for example you will set the frozen pet bottles same number of puupies. Look at the photo. the white puppy feels so good by the frozen pet bottle.